The USD 5 billion factory in Anantapur is Kia’s 15th such facility across the globe and the company held a formal ceremony to mark the completion of construction of the facility which covers a sprawling 536 acres. The occasion was also used to launch the Kia SP2i, which is positioned as the brand’s new flagship car for the Indian market. The Kia SP2i is an SUV inspired by the Kia SP Concept, which was first displayed at the Auto Expo in 2018. The Kia SP2i highlights Kia’s flair for cool, modern design and cutting-edge technologies. The trial production of the new model will allow Kia to further refine the manufacturing equipment and technologies at the factory before Kia embarks on series production later in 2019. The event to mark the commencement of trial operations at the plant was attended by eminent dignitaries like the Chief Minister of the state of Andhra Pradesh, N Chandrababu Naidu; Shin Bongkil, Ambassador of Republic of Korea; Han-Woo Park, President and Chief Executive Officer (CEO) of Kia Motors India and Kookhyun Shim, Managing Director (MD) and CEO of Kia Motors India. 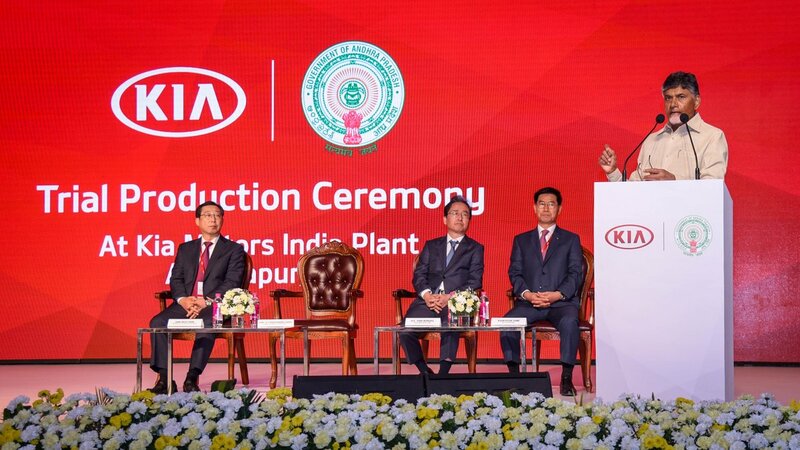 Speaking at the ceremony, Han-Woo Park – President and CEO of Kia Motors Corporation said that India will play a key role in expanding the global footprint of Kia Motors’ global footprint and the ceremony marked another chapter in Kia’s success story in India. Kia also used the ceremony to consolidate its Future Mobility Partnership with the government of Andhra Pradesh by handing over a new Kia Soul EV. The new EV will add to Kia’s range of vehicles with advanced, eco-friendly powertrains. Kia had recently signed a memorandum of understanding with the Andhra Pradesh Government to develop the electric mobility infrastructure and had handed over three models of Kia Motor’s Nero cars, which includes an EV, a plug in and a hybrid. This partnership with the government of Andhra Pradesh will further reinforce Kia’s commitment to supporting the government’s drive to popularize EVs and to develop a local EV charging infrastructure.